One question I get asked a lot is how can you tell a good Amish Friendship Bread starter from a not-so-good Amish Friendship Bread starter? 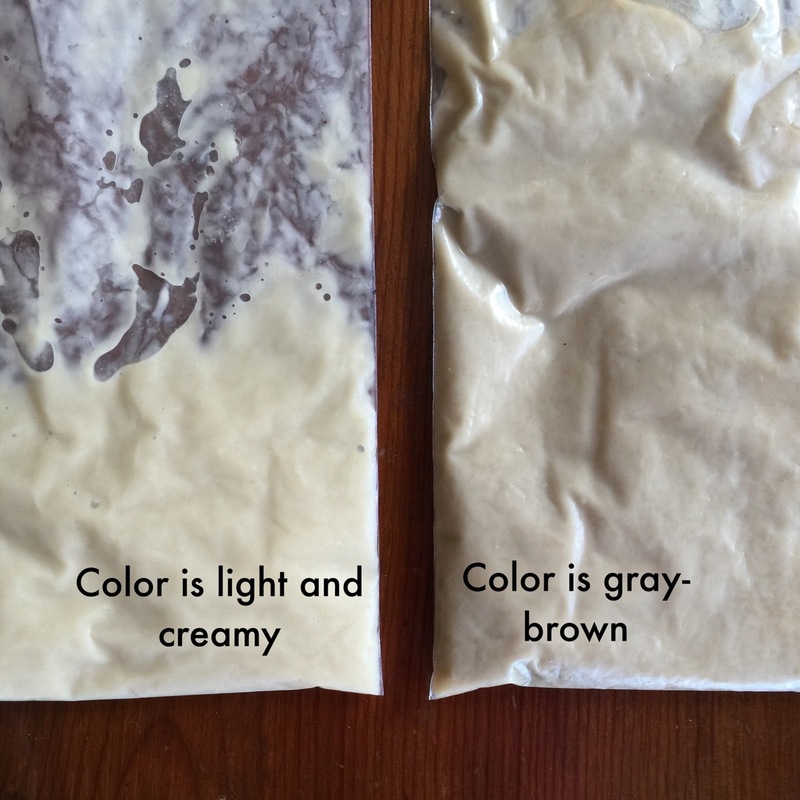 Here’s another scenario: starters that are refrigerated or frozen for long periods of time do tend to change color, usually going a shade darker. Here are two Amish Friendship Bread starters, side by side. One is good. The other … not so much. It’s pretty easy to tell which one looks healthier. The color, for one thing. The presence of a few bubbles is another. 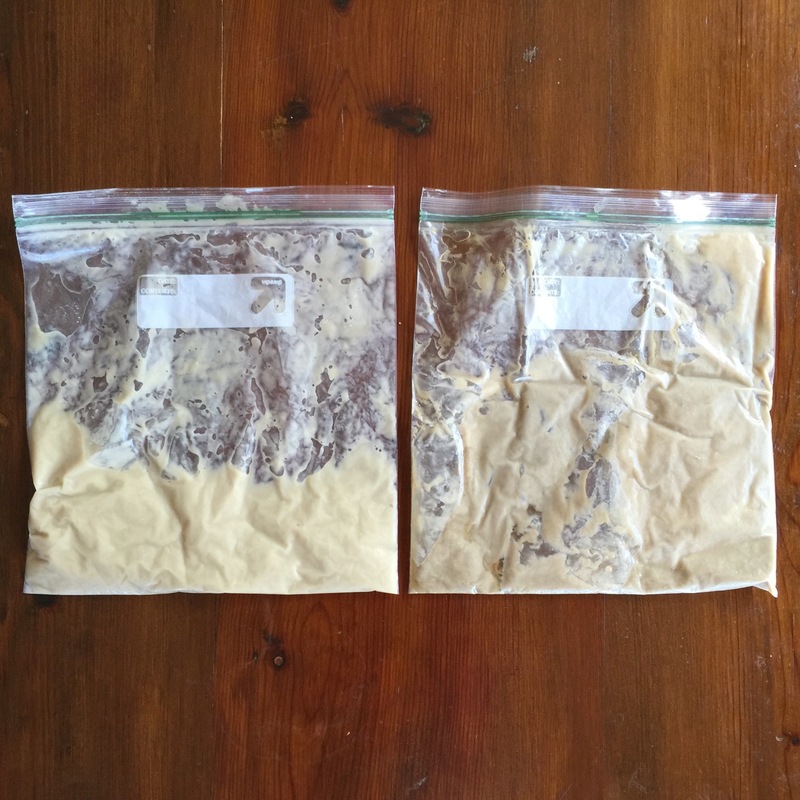 And if you were able to crack the bags open and take a whiff, the one on the left smelled nice and yeasty while the other smelled like nothing at all (this will not always be the case—old, underfed or spoiled starter can smell quite awful. Read more about that here). This particular bag had been neglected in the fridge for a few weeks so it was underfed and no longer active. As hardy as the starter can be, it needs to be fed. Period. You should also be seeing some bubbly activity within 24-48 hours of every feeding. If the amount of bubbles starts to decrease, you might need to reduce your starter to one cup and start feeding it as if it were Day 6. Presence of mold. This usually happens to people who pop their starter in the fridge, wanting to buy a couple of days of no feeding but not wanting to commit to freezing their starters, and then forget about their starter. Yes, AFB starter is hardy, but it needs to be fed. If your starter turns pink or has pink splotches, throw it out. After feeding it, nothing happens. Again, every starter (and kitchen) is different so you don’t want to be impatient. But if you’re feeding it at the proper ratios (1 cup starter = 1 cup flour, 1 cup sugar, 1 cup milk) and nothing happens for the next 24-48 hours, then maybe give it a pass. I say maybe because if you have a cooler kitchen, you may want to go 72 hours. If you’re seeing SOME bubbles, this is a good sign, even if your bag isn’t blowing up or your starter overflowing. Move your starter to a warm place and give it a chance. If it looks flat after three days, let it go. It still smells bad after feeding and/or discarding a portion of your starter. That sharp acetone smell isn’t a bad thing exactly — it just means your starter is hungry. So feed it at the proper proportions (see paragraph above). If you have a lot of starter, say 3 cups, that means you need to feed it 3 cups flour, 3 cups sugar, 3 cups milk. I know you know someone who feeds their starter a minimal amount and it’s bubbly and thriving. That can happen, but starters need to be properly fed, so build a hardy starter by keeping the proper proportions. If necessary, stir well and then toss 2 cups of your starter and feed the 1 cup of starter with 1 cup flour, 1 cup sugar, 1 cup milk. If it still smells strongly of acetone and there’s no activity, say goodbye. The more you care for your Amish Friendship Bread starter, the easier it will be to determine if your starter’s ready to be baked or if it’s gone down a path of no return. Good starters require proper feeding ratios, lots of patience, and lots of love. And once you have a starter that just won’t quit, don’t forget to name it! >> Check out more tutorials here. >> Post a picture of your starter on Facebook here or add it to our starter gallery by submitting it here. Tutorial – What Should Your Starter Smell Like? Hi Judy! You can store your starter however you like — we use Ziploc bags for the freezer and to give them away, and glass containers for our counter or fridge. The 1 cup is only a suggestion — do whatever works best for you! Hi, are you only able to use the start every 10 days, or can you take some more often? I would love to be able to make different breads more often if it works that way. Hi Jacki! Once you get a starter going and you’ve done one 10 day cycle, then you can use it at any time as long as you’re maintaining it every 6 and 10 days with a feeding, feel free to bake away! In the beginning I was like you and baking ALL the time — it was great having it on hand and playing with the recipes. Good luck! Can you add more yeast to starter if it’s not bubbly? Hello! Last year I had 7 starters going to make Friendship Bread with my students. I’m doing the process again this year but my starters are acting VERY differently. I made them on Monday (today is Wednesday) and nothing has been happening with them. There are a couple little bubbles but I haven’t had to burp the bags or anything, which is really worrying me. Last year the bags expanded so much I had to release the pressure half way through the first night, and this year there’s literally no pressure built up at all. Is something wrong with my starters? I really don’t want this to not work and disappoint my students! Hi Stephanie! Sorry for the late reply, but yes, you’re right–you should definitely be seeing some bubbly action within 24-48 hours after you’ve made/fed the starter. The only thing I can think of is: (1) your yeast wasn’t fresh, or (2) your kitchen/classroom area is too cool. If the temperature of the room is cool to cold, the starter will go dormant, or at least slow down considerably. Can you let me know what happened? Happy holidays! Hi Vikki! See my response above. Happy holidays! Hi, I love your site and the many tutorials as I am new to AFB. I went through my first 10 day cycle from a new starter that I made. That starter yielded 7 cups! I baked one and saved one for myself which is currently on day 2. So. This day 2 is much quieter than I’ve ever seen it but i do see few bubbles and still smells yeasty. Should I feed it to get it active again? I did just feed it yesterday on my day 10 right before I divided it into 1 cup portions. The thing was when I went to add the 1 1/2 cups milk, sugar and flour, i forgot and used a metal whisk briefly then switched over to a silicon whisk when I realized my mistake. After mixing I made the mistake Of using my metal 1 cup to divide and then switched to a glass cup after I realized my mistake. Do you think this is why it’s not as active as it was? I’d think it would be much more active as I fed it just yesterday before dividing and transferring to new bags. What should I do? Hi Quyen! Great questions! No need to worry. Starters are often quiet after they are separated into bags and containers. As long as there are still bubbles, it’s a healthy color, and it smells yeast-y, your starter should be fine. No need to feed again until Day 6, then again on Day 10. Your metal kitchenware is not to blame. Most stainless steel coated whisks, measuring cups, and even bowls are safe to use with your starter as long as they are not scratched, exposing the cheaper, more harmful metal beneath. You’ll know if metal has affected your starter because it will turn faint green or faint pink in color and smell funny. Most likely, kitchen temperature is causing your starter to be less active. Make sure you store your starter in a warm place in your kitchen order to help your starter stay healthy and active. Happy baking! Hi, I am new to AFB and made my first batch of starter 11 days ago. I was able to get 7 cups out of my starter! I portioned the starter into 1 cup ziplock bags and baked 1 cup for my first ever 2 loaves of AFB. It was delish! Thank you for posting the starter and original recipe as well as all the tutorials. My question is this. I accidentally used a metal whisk to mix in my 1 1 1/2 cups of flour, sugar and milk. But quickly switched to a silicone whisk. I then made the same mistake again and used a metal 1 cup to portion out 2 1 cups into bags before I realized it and switched to a glass cup. Now the 1 cup bag I have growing on my counter has been quite quiet since yesterday (my 10th day feeding/dividing/baking). It still smells yeast but doesn’t seem very active. I would think it would be as I just fed it yesterday. Should I give it one more day and refeed to try to wake it up or should I just make a new starter? I have a starter. It is baking day, day 10. But I forgot to feed on day 6. What should I do? I made a rather large batch of muffins – 2 dozen, plus a small loaf last night. Morphed the recipe to dump the extra cup of sugar and milk (cuz it said u could use juice) at baking stage. Put a can of pineapple crush, 2 grated carrots, and a cup of choco chips. Quite yummy ifn I do say so myself! I made a starter yesterday. It has been 17 hours. The batter rose but there is no bubbling. I only had yeast that was outdated by 4 months and the kitchen is cool. Should I wait 24-48 hours before I toss and start again? Since this is day 2, should I stir/mash even though there is no bubbling activity? Hi Linda! So the outdated yeast isn’t a great sign. But the starter rising is! So yes, stir it anyway. I would hang in there a couple of days — place it near something warm, like the oven or toaster oven, and place in oven or microwave overnight so it doesn’t get too chilly. If you see no activity at all by Day 6, you have a choice: start over (with fresh yeast), or go for broke: feed your starter and give it a few more days. 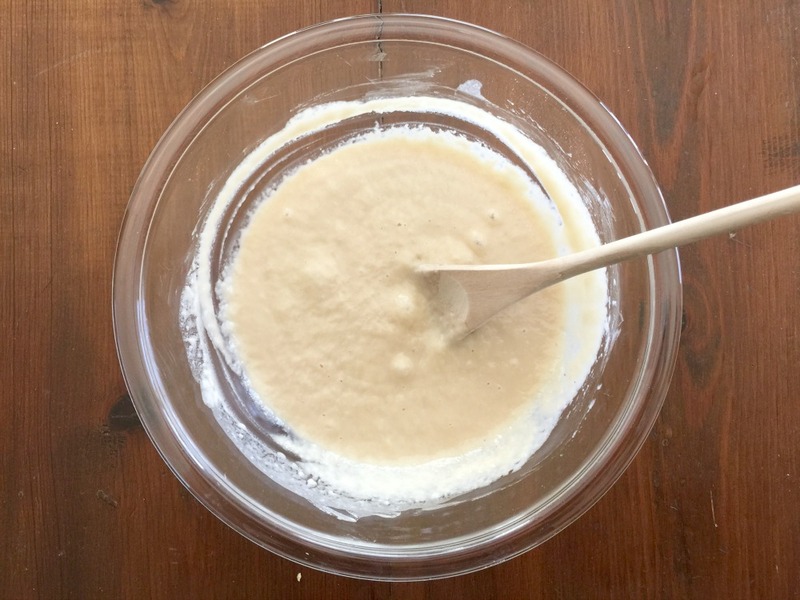 Regular sourdough starters take a while to get going, almost 2 weeks, so by using commercial yeast and all that sugar (sugar in the milk, too), we’re giving it a boost. I have honestly seen flat, no-movement starters come back from the dead, so sometimes it just takes time for the natural yeast activity to get going. What you don’t want is to neglect it. Regular feeding, baking, and discarding (if you have too much), is the key to a healthy starter. If you feed a starter regularly at the right ratios (1 cup of starter should be fed 1 cup of flour, 1 cup of sugar, 1 cup of milk, so 2 cups of starter would double the feeding), otherwise your starter won’t have enough food to grow. Hope this helps and keep us posted!